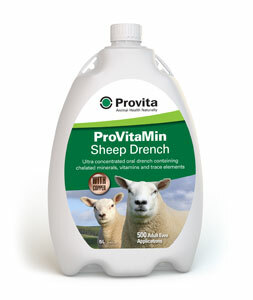 ProVitaMin is an ultra-concentrated oral drench with additional copper, that contains 25 broad spectrum elements to improve performance in sheep. It provides a concentrated blend of chelated minerals, vitamins and trace elements ensuring maximum bioavailability for fertility in ewes and thrive in lambs. Only feed to sheep requiring additional copper. Highly concentrated formula, 10ml application for an adult sheep. Available in 5 litre, 2.5 litre and 1 litre.